Last week, I wrote about the buzziest books at Book Expo America. Some of those overlap with this collection of new books from old (as in "previously published") authors I can't wait to get to. There were only a few books I had on my absolutely-must-pick-up-at-Book-Expo list (I wasn't flying straight from Chicago home, so I limited the number of books I picked up to an extreme few and focused instead on discovering new titles to request later on down the road). One of these was the new Maria Semple book, Today Will Be Different (Little, Brown, October 2016); I was a huge fan of Where'd You Go Bernadette, so will naturally leap at the opportunity to read more of Semple's dry humor. I also adored Amor Towle's debut, Rules of Civility, so have been over here petting his new novel, A Gentleman in Moscow (Viking, September 2016); when I got my copy of this one signed by Towles, he told me he thinks this second novel is better than his first. Yes, please. 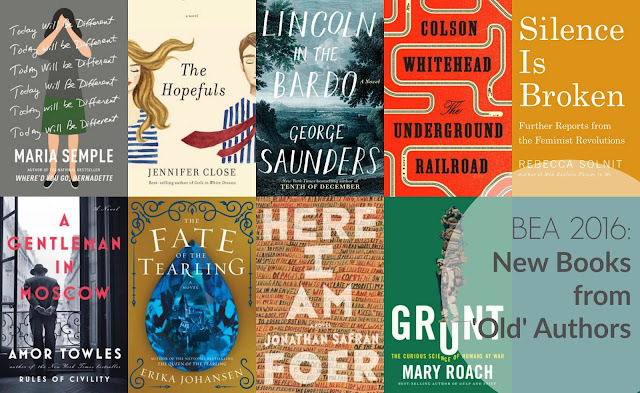 Tons of reviewers I know and trust lined up for the new George Saunders novel, Lincoln in the Bardo (Random House, January 2017). I'm only just getting to my first of Saunders' work (The Tenth of December), but based on what I've read so far, I know I'm going to want to read this new novel too. Jennifer Close also has a new novel out (The Hopefuls, Knopf, July 2016), as does Jonathan Safran Foer (Here I Am, FSG, September 2016). This marks his first novel since 2005, and first new book since 2010. I'm also squealing with delight for Colson Whitehead's newest book, The Underground Railroad (Doubleday, September 2016)--not least of which because Liberty says it's "omgsogood". So there's that. I've loved everything Mary Roach has ever written (and yes, I've read all her books), so I nearly jumped for joy when I had the chance to catch up with the lovely Norton folks about Roach's newest scientific study, Grunt: The Curious Science of Humans at War (Norton, June 2016). I'm told this is much more about how to keep humans alive and intact during war (versus all of the research that goes into how best to kill), which is just the kind of military science I'd like to know exists. Continuing the non-fiction bent, Rebecca Solnit is releasing a follow-up to her feminist work, Men Explain Things to Me, next year: Silence Is Broken (Haymarket, March 2017). Oh hey, and ya'll knew there was a new Tearling novel out in November, right?? (The Fate of the Tearling, Harper, November 2016). What much-loved authors are you most excited to see new books from this year? Two more BEA round-ups to follow this week and next: a spotlight on indie & university presses, and a round-up of the incredibly varied and fascinating non-fiction on the floor. Say hello to some new reading options, Social Justice Book Club.